Elmer Rice's The Adding Machine has long been cited as a fine example of American expressionism. That means the tone is a bit surreal and strange, with a dark, nightmarish story and characters like Mr. Zero, the antihero hero, who personifies man's inhumanity during the Machine Age more than a real person. Rice was a major player in American theatre in the early part of the 20th century, even though he wrote only two well-known plays, The Adding Machine and Street Scene, both of which made it to Broadway. Street Scene was made into a 1931 movie starring Sylvia Sidney. The Adding Machine also got a movie, but not till 1969. In that one, Milo O'Shea and Phyllis Diller (!) played Mr. and Mrs. Zero. The plot is pretty simple, in an expressionistic and surprising sort of way. Mr. Zero is a nothing, a nobody, as you might guess from the name, and he works (and has worked for the last 25 years) as a bookkeeper at the same company. But progress marches on, and the day comes when the boss tells Mr. Zero he's been replaced by an adding machine. His job -- annoying and monotonous as it is -- is the only thing he has, and he strikes out when he's fired, killing his boss. That results in a murder trial and execution, after which Mr. Zero gets sent to the Elysian Fields. Happily ever after in the afterlife? Nope. He's still just a cog in a huge machine, doomed to continue to repeat his mistakes. 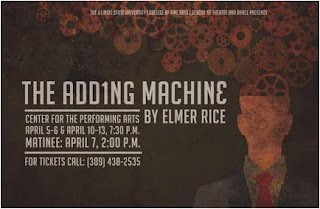 Companion pieces for The Adding Machine might be Fritz Lang's Metropolis, an example of German expressionism with a similar critique of industrialization at the expense of the worker, or Charlie Chaplin's Modern Times, which gives the Man vs. Machine issue a comic twist and a sweet, appealing hero, or Stairs to the Roof, a Tennessee Williams play inspired by The Adding Machine. 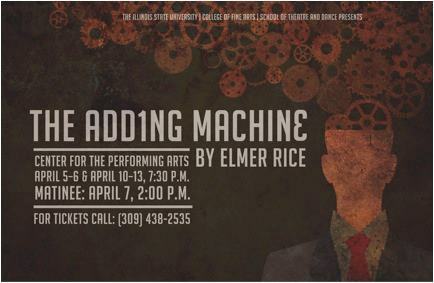 Third-year MFA director Jeremy Garrett has put his stamp on Illinois State University's Adding Machine, with David Fisch as Mr. Zero and Caitlin Boho as his nagging missus. Others in the cast include Storm Angone, Pat Boylan, Trace Gamache, Lizzy Haberstroh, Matt Helms, Dominique Jackson, Drew Mills, Kent Nusbaum, Jenny Oziemkowski, Jason Raymer, Allison Sokolowski, Kelly Steik, Kaitlyn Wehr and Arif Yampolsky. Jake Wasson is the scenic designer, with Olivia Crosby as costume designer and Deborah Smrz as lighting designer. The play opens tomorrow night in the ISU Center for the Performing Arts, with performances at 7:30 pm through April 13, and one Sunday matinee on April 7 at 2 pm. Click here or here for ticket information.